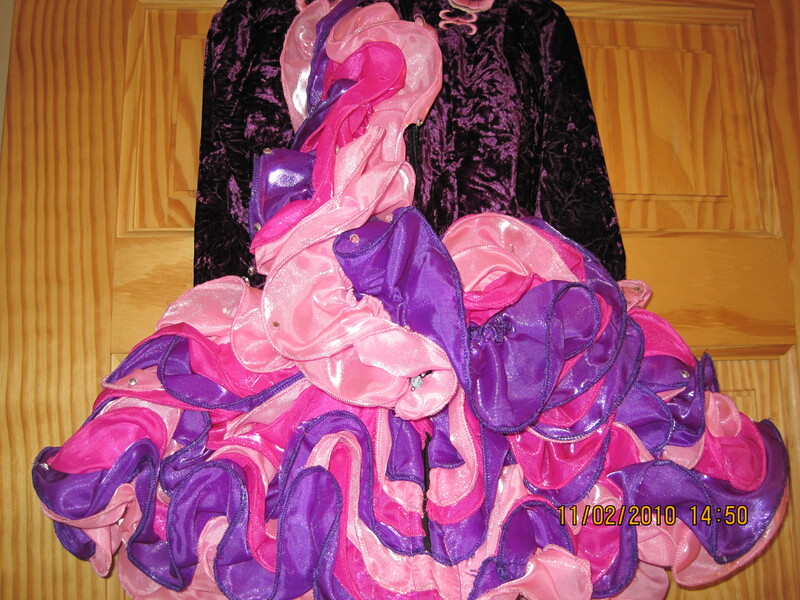 For Sale Fantastic/Stunning Up-to-date Solo Dress Shauna Shiels, made mid 2009 suit age 7-9 years. 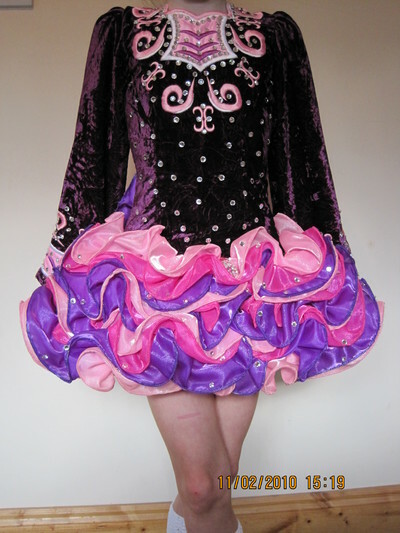 This Fantastic/Stunning Shauna Shiels Solo Irish dancing dress For Sale, would suit age 7-9 years or under depending on the height of the dancer 116 -120 cm The dress was worn since July, and selling due to growth spurt, don’t want to alter the dress, it has Stunning/Brilliant stage presentation, and loads of comments on and off the stage too. 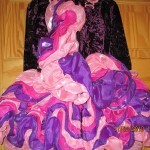 The dress is made of Crushed Purple Velvet with Baby pink and White embroidery on Neck and sleeves, with loads of Swarovski Crystals thought-out this Costume, Its skirt it the Frilled style, with various colours of Cerise Pink, Baby Pink and Purple in it, and Swarovski Crystals on them also, the Sash is made to match the Skirt, and its usual with Swarovski crystals and one big Swarovski Crystal in the bottom of it, new dropped waist style It fits like a glove and extremely light weight, about 2 kg. 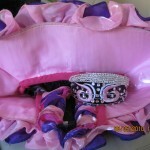 It was worn by dancer placed 2nd in Dublinâ€™s 2009. The dress is also located in the make over’s on the previous page. 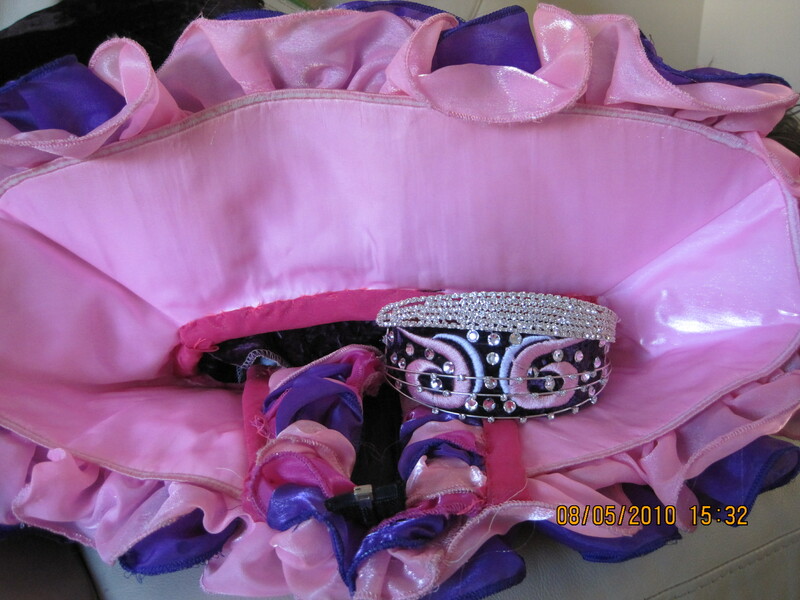 The under dress is baby pink, and also kick pants, the Headband is the same Velvet with the same design at the time of bodice, with Swarovski Crystals, This has been a very lucky dress and hate to part with it, but some lucky little dancer with also be so lucky too. If more photos are required please do not hesitate to contact me as they are worth looking at. Sale price is €800 postage extra, outside Ireland, willing to meet. Price is negotiable. 3 inch let out on either side of the Zip and Skirt to so 6 inches on both. Bodice 2 inch let down. Asking Price: €800 or nearest offer. Shipping costs not included. Sale is final.